He was found by a another dog of a local hunter sometime in the Fall. No one knows how long Buster was in the woods, trying to fend for himself and he was found in very poor condition. The hunter who found Buster brought him to his home knowing he could not leave him outside, alone. One of his friends knew of a rescue in South Carolina that they could take Buster to. Hugs for Hounds Rescue came to Buster’s rescue. Cheryl let Buster stay with her and her family, let him sleep on her beds, did vetting and took care of the starving boy. After being with Hugs for Hounds, they found a rescue in Pennsylvania. Buster was transported to this new shelter, but was then transported back to South Carolina. 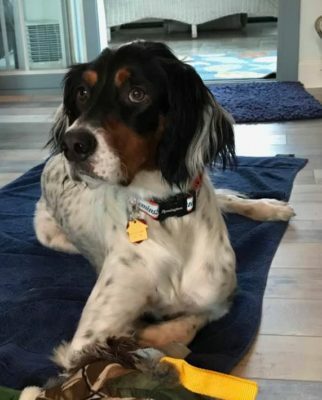 A Better English Setter Rescue and dedicated volunteers, pulled Buster from a shelter where he was on the list to be put down. Kim, Buster’s foster mom, drove from Florida to South Carolina to rescue this sweet boy and give him the love he deserves. He also got to play with his foster brother Jake! Carmen had recently lost her English Setter, Lucy, and saw Buster’s intake photo. Carmen could not get his picture out of her mind and saw he was available for adoption and the rest is history! She became his adopter! If it wasn’t for the hunter in South Carolina and his dogs, Cheryl from Hugs For Hounds Rescue in South Carolina, the vets and clinics and Diane, his rescue mom, his foster mom Kim and her forever foster Jake. 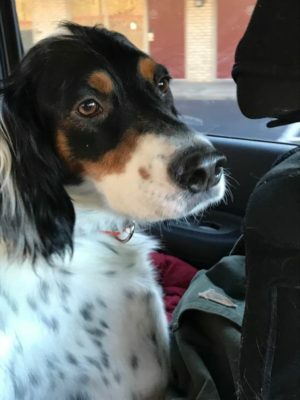 A big thank you to A Better English Setter Rescue and all of their volunteers who transported Buster to Northern New Jersey to his forever home. Buster was my last foster. He is such a great dog! He and his foster brother, Jake were so much fun to watch. It was hard to let him go, but I am so grateful that Carmen became his furever mom. He is a lucky dog. Love, love, love him! Thank you to everyone that helped in making this story such a happy ending. You’re all awesome!